In spite of the title, I promise this is not a political post. I am merely continuing my aviation theme for the A to Z Challenge. You see, for an entire week in 2007, I transported Senator Obama and his team around the country while he campaigned for the Democratic nomination. I don’t believe any of them were under 6 feet tall, and I was surprised that they had contracted an aircraft as small as a Lear 35 – at 5’2”, I cannot even stand upright in the cabin – to ferry them from place to place. When I commented on this, I was told that the Senator had originally tried to do most of his traveling on the commercial airlines, but as the campaign progressed, it became too difficult to get to events in a timely manner when everyone in the airport wanted to meet him. Heck, it can be a giant pain to get through the terminal for the Invisible Man, so I was impressed they had even made the attempt in the first place. During my years as a charter pilot, I have had a wide assortment of passengers, some of whom were more affable than others. I can honestly say that this was one of the most pleasant experiences of my career. While the Senator did not have time to do more than pose for a picture and autograph his book for me, his staff was another story. Throughout the week, I had the opportunity to chat with most of them and even a few of the retired Secret Service agents, when they weren’t accompanying Obama to events. Every single one of them was cheerful, friendly, and a joy to fly. They made me feel like one of the team instead of the hired help, and I appreciated that. 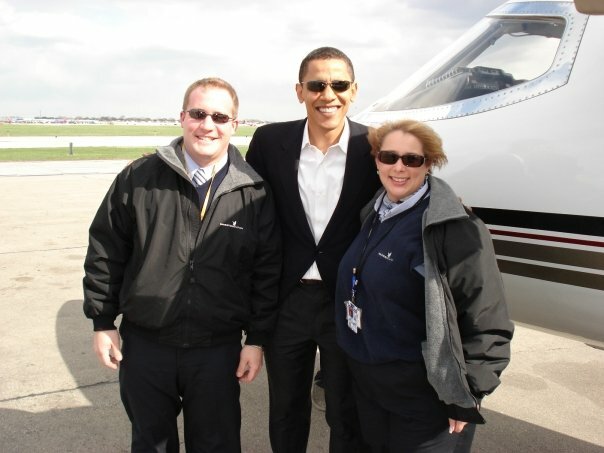 A few months later, I was part of a crew sent to Des Moines, IA to pick up passengers and take them to Washington D.C. That was how I ended up having Obama and his staff members- many of whom greeted me (by name!) like an old friend – as my passengers, one more time. I don’t care who you are. That’s just cool. Thanks Larry. I was hoping to be in the running to fly Air Force One, but so far no such luck. Well, you just returned the favor. Right back atcha. You are too kind – thank you!